Are you tired of the LCO mispronouncing your name, getting your flight info incorrect, waiting in line to fill out your flight info, finding a pen that writes or a pen where the ink is not boiling hot or frozen solid? If this sounds like you, then these online flight cards are for you. Come prepared with these pre-filled flight cards, type your entries in ahead of time and avoid the long RSO lines where the less informed and less prepared are still searching for flight cards and pens. Use your mouse and keyboard to enter or pre-enter your flight information and then print. 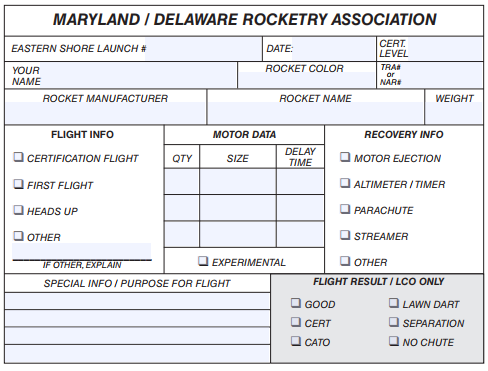 Do not complete any info on the back of the flight card as that is reserved for the RSO during the RSO process. Click the flight card image below to get started or click the phrase “Yes, I want to complete the flight cards ahead of time” and get to flying. As always, all flight cards must contain valid and correct information, including dates, ESL numbers, and such. All flight cards must be printed duplexed (front and back) and cut to proper size. RSO reserves the right to reject any flight card that does not conform to MDRA requirements. See you at the RSO table.